Apa sih SMART GRID ? Apakah perlu jaringan terpisah untuk trafik M2M ? To run a PEV as cleanly as possible, it needs to be charged in the wee hours of the morning, when powerdemand is at its lowest and when wind power is typically at its peak. Smart Grid technologies will help to meet this goal by interacting with the PEV to charge it at the most optimal time. But sophisticated software will assure that your PEV is still fully charged and ready to go when you need it. And you'll still be able to demand an immediate recharge when you need it. "Distribution intelligence" refers to the part of the Smart Grid that applies to the utility distribution system, that is, the wires, switches, and transformers that connect the utility substation to you, the customers. The power lines that run through people's back yards are one part of the power distribution system. A key component of distribution intelligence is outage detection and response. Today, many utilities rely on customer phone calls to know which areas of their distribution system are being affected by a power outage. Along with smart meters, distribution intelligence will help to quickly pinpoint the source of a power outage so that repair crews can be immediately dispatched to the problem area. A utility's outage response can also improve. Most utilities count on complex power distribution schemes and manual switching to keep power flowing to most of their customers, even when power lines are damaged and destroyed. However, this approach has its limitations, and in many cases an automated system could respond more quickly and could keep the power flowing to more customers. By having sensors that can indicate when parts of the distribution system have lost power, and by combining automated switching with an intelligent system that determines how best to respond to an outage, power can be rerouted to most customers in a matter of seconds, or perhaps even milliseconds. It may even be possible to react quickly enough to power disturbances so that only those in the immediate neighborhood are affected, while other customers' power source are rerouted fast enough to avoid any interruption in power. This capability could be the first example of the highly touted "self-healing" aspect of the Smart Grid in action. Outage response is one aspect of distribution intelligence that is commonly referred to as distribution automation(DA). DA may actually be the oldest segment of the Smart Grid, because utilities have been automating their distribution systems since the 1960s. But while DA initially focused just on remote control of switches, the Electric Power Research Institute now considers distribution intelligence to mean a fully controllable and flexible distribution system. Combining DA components with a set of intelligent sensors, processors, and communication technologies will lead to distribution intelligence. When fully deployed, distribution intelligence will enable an electric utility to remotely monitor and coordinate its distribution assets, operating them in an optimal matter using either manual or automatic controls. Along with outage detection and response, another potential application of distribution intelligence is the ability to optimize the balance between real and reactive power. Devices that store and release energy, such as capacitors, or that use coils of wire to induce magnetic fields, such as electrical motors, have the ability to cause increased electrical currents without consuming real power; this is known as reactive power. A certain amount of reactive power is desirable within a power system, but too much reactive power can lead to large current flows that serve no purpose, causing efficiency losses as they heat up the distribution system wires. An intelligent distribution system can use power electronics to maintain the proper level of reactive power in thesystem. Distribution intelligence can also help to protect and control the feeder lines, the power lines that make up the distribution system. Most feeder lines are now protected by breakers or relays that trip when high currents flow through the line, a situation normally caused by a fault somewhere in the system. These relays sometimes incorporate time delays to allow for momentary flows of high current, which may be caused by industrial equipment powering up, rather than a fault. Protection systems are often a combination of instantaneous breakers with high current settings and time-delayed breakers or relays with lower settings. These systems of automated breakers and relays end up being a balancing act: they must allow the system to operate with high currents when needed but protect the system and the people around it from high current flows when a fault exists. Distribution intelligence can provide a more elegant approach to protecting the feeder lines, using sophisticated monitoring and controls to detect and correct for faults while maintaining the highest level ofsystem reliability during non-fault conditions. An intelligent system could even detect and isolate faults in specific pieces of equipment and route power through a backup system instead, maintaining power reliability. Distribution intelligence can also incorporate more sophisticated ground-fault detectors to minimize the possibility that people can be shocked or electrocuted when encountering downed power lines. Most utilities are only starting on the road to true distribution intelligence, but the market is expected to boom in the coming years. Today's electrical transmission system—including the giant power lines and transmission towers that snake across our landscapes—operates much like a system of interconnected streams. Power flows through the transmission system along the path of least resistance, finding multiple paths between the power plants and the cities that are demanding the power. Grid operators actually have very little control over today's system. Their primary task is to make sure that as much power is being generated as is being used—if not, the grid's voltage could drop, causing the grid to become unstable. Operators generally know which lines are in service and when relays have opened to protect lines against faults, but they have limited control capabilities. Unfortunately, like water in a bathtub, power can "slosh around" within the grid, developing oscillations that, under the worst of conditions, could lead to widespread blackouts. To compound the problem, grid operators also have limited information about how the power is flowing through the grid. The Smart Grid will help solve this problem by adding new capabilities for measurement and control of the transmission system. These technologies will make the grid much more reliable and will minimize the possibility of widespread blackouts. August 14, 2003, is a date that few grid operators in North America will ever forget. Although power demand was high that day, the situation seemed under control until a relatively insignificant power line in Ohio overheated and tripped offline. Like throwing a rock in a pond, that power line failure triggered oscillations in the transmission systems that line the shores of the Great Lakes and provide power to the Northeast and parts of Canada. Those oscillations eventually overloaded the system, causing a massive blackout that stretched from Michigan and Ohio, through the Northeast, and into Canada. With subways down, many commuters in New York City struggled to find a way home. The blackout affected an estimated 10 million people in Ontario, Canada, and 45 million people in eight U.S. states. Smart Grid technologies offer a new solution to the problem of monitoring and controlling the grid's transmissionsystem. New technologies called Phasor Measurement Units (PMU) sample voltage and current many times per second at a given location, providing a snapshot of the power system at work. PMUs provide a new monitoring tool for the Smart Grid. In our current electric grid, measurements are taken once every 2 or 4 seconds, offering a steady-state view into the power system behavior. Equipped with Smart Grid communications technologies, measurements can be taken many times a second, offering dynamic visibility into the power system. This makes it easier to detect the types of oscillations that led to the 2003 blackout. Smart Grid technologies also offer new means of controlling the transmission system. New high-power electronics function essentially as large-scale versions of transistors, adding a new level of control to the transmission system. New technologies could also help dampen unwanted power oscillations and avoid unproductive flows of current through the grid that only serve to waste energy. The combination of new measurement and control technologies also enables a new automated approach to controlling the grid. Software could potentially monitor the grid in real time for potential disturbances that could lead to blackouts, and it could take actions to check the disturbances. Such monitoring software could act to dampen out oscillations in the power grid, or it could even reroute power through the grid to avoid overloading atransmission line. In the event that a power line needs to be removed from service, control software could reroute the power in a way that causes minimal disruptions to the grid. This approach is often referred to as the "self-healing" grid. The ideal self-healing grid will involve a combination of transmission system monitoring and control software and comparable measures for the local distribution systems that deliver the power to individual homes and businesses. These distribution system measures are sometimes referred to as distribution intelligence. Another contributor to the 2003 blackout was the limited situational awareness of the various grid operators involved. At the time, there was limited data sharing and transparency among the grid operators in different regions of North America, making it hard for the individual grid operators to see the big picture. By including new standards that make it easier for grid systems to interact with one another, the Smart Grid will make data sharing among regional grid operators easier to accomplish. Potentially, grid operators will be able to explore the state of the grid at the national level and switch within seconds to explore specific details at the local level. These technologies will provide rapid information about blackouts and power quality as well as insights intosystem operations for utilities. The Smart Grid will enable enhancements to these net metering programs. For instance, a utility might pay more for customer-generated power during times of peak power demand, while paying less for off-peak power. Liketime-of-use pricing, such a pricing structure will encourage home generators to minimize their energy use during times of peak demand so they can maximize the amount of power fed onto the grid. For instance, smart appliances could offer countless subtle ways for utilities to shift electrical demand to off-peakhours. Your dishwasher could defer running until later in the evening, or your refrigerator could defer its defrost cycle. Your air conditioner could slightly extend its cycle time to help lower your power demand during peak hours. Unneeded lights or electrical devices could even power off. Overall, the Smart Grid will open the door to many new possibilities for utilities and their customers to reach agreements on ways to save energy. The financial incentives available could encourage a wide range of new consumer options. You may be willing to pay a bit extra for a smart appliance, for instance, if it can also become a new source of revenue for you. And utility incentives could also encourage you to install a home generationsystem, such as a small wind turbine or solar power system. The result is a win-win-win: a win for you, for your power provider, and for your community. President Obama has called for the United States to secure 25% of our electricity from clean, renewable resources by 2025. And yet, renewable sources other than hydropower still provide only about 5% of the electricity supply for our grid. What’s holding us back? Our grid is partly to blame. The physical reality is that the wind, solar, and geothermal resources are usually located in remote places, while much of the power demand is in urban areas. Like the interstate highway system, we need an electric superhighway that provides infrastructure for electricity to get from North Dakota to New York City easily and efficiently. Geography issues aside, the current grid has difficulty accommodating variable sources of power like wind and solar energy, the fastest-growing sources of renewable power on the grid. As these resources begin to supply increasing percentages of power to the grid, integrating them into grid operations will become increasingly difficult. The Smart Grid will be able to make better use of these energy resources. It will give grid operators new tools to reduce power demand quickly when wind or solar power dips, and it will have more energy storage capabilities to absorb excess wind and solar power when it isn't needed, then to release that energy when the wind and solar power dips. In effect, energy storage will help to smooth out the variability in wind and solar resources, making them easier to use. Building an electric superhighway can also help solve the problem, as it will help to ship the power to where it is needed. Studies have shown that connecting wind resources from a diversity of geographic locations helps to balance out fluctuations in wind power. In other words, when the wind isn't blowing in Iowa, in may be blowing in North Dakota or Wyoming. Having such geographically diverse wind resources on a single electric superhighway will result in a more steady supply of wind power to the nation's power grid, making it easier for grid operators to make full use of this resource. How will the Smart Grid affect your home? It won’t look very different, but behind the scenes a lot will be happening. Even right now, in many cities across the nation, new equipment, appliances, and software are available that use emerging Smart Grid technologies to save energy, seek out the lowest rates, and contribute to the smooth and efficient functioning of our electric grid. A key element that allows all of the emerging Smart Grid technologies to function together is the interactive relationship between the grid operators, utilities, and you. Computerized controls in your home and appliances can be set up to respond to signals from your energy provider to minimize their energy use at times when the power grid is under stress from high demand, or even to shift some of their power use to times when power is available at a lower cost. An EMS also allows you to monitor real-time information and price signals from your utility and create settings to automatically use power when prices are lowest. You can also choose settings that allow specific appliances and equipment to turn off automatically when a large demand threatens to cause an outage—avoiding peak demandrates, helping to balance the energy load in your area, and preventing blackouts. Your utility may provide financial incentives for doing so. In your smart home, many of your appliances will be networked together, allowing you to access and operate them through your EMS. An EMS provides the ability to turn on your heater or air conditioner from work when you’re about to go home or keep track of the energy use of specific appliances or equipment—like tracking the energy use of your pool pump, or seeing how much energy you saved with your new Energy Star dishwasher. Smart appliances will also be able to respond to signals from your energy provider to avoid using energy during times of peak demand. This is more complicated than a simple on and off switch. For instance, a smart air conditioner might extend its cycle time slightly to reduce its load on the grid; while not noticeable to you, millions of air conditioners acting the same way could significantly reduce the load on the power grid. Likewise, a smart refrigerator could defer its defrost cycle until off-peak hours, or a smart dishwasher might defer running until off-peak hours. Of course, these smart appliances will include consumer controls to override the automated controls when needed. If you need to run your dishwasher right away, regardless of the cost of power, you'll be able to do so. One unique type of smart "appliance" is the plug-in electric vehicle, or PEV. See the PEV Section for information on how PEVs will interact with the Smart Grid. As consumers move toward home energy generation systems, the interactive capacity of the Smart Grid will become more and more important. Rooftop solar electric systems and small wind turbines are now widely available, and people in rural areas may even consider installing a small hydropower system on a nearby stream. 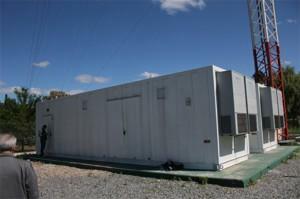 Companies are also starting to roll out home fuel cell systems, which produce heat and power from natural gas. The Smart Grid, with its system of controls and smart meters, will help to effectively connect all these mini-power generating systems to the grid, to provide data about their operation to utilities and owners, and to know what surplus energy is feeding back into the grid versus being used on site. A potential feature of the Smart Grid will be to allow your community to use your solar array—and your neighbor’s—to keep the lights on even when there is no power coming from a utility. Called “islanding,” it will allow a home to grab power from “distributed resources,” such as local rooftop solar, small hydropower, and wind projects, until utility workers can bring the grid back online. Maybe you have heard of the Smart Grid on the news or from your energy provider. But not everyone knows what the grid is, let alone the Smart Grid. "The grid," refers to the electric grid, a network of transmission lines, substations, transformers and more that deliver electricity from the power plant to your home or business. It’s what you plug into when you flip on your light switch or power up your computer. Our current electric grid was built in the 1890s and improved upon as technology advanced through each decade. Today, it consists of more than 9,200 electric generating units with more than 1 million megawatts of generating capacity connected to more than 300,000 miles of transmission lines. Although the electric grid is considered an engineering marvel, we are stretching its patchwork nature to its capacity. To move forward, we need a new kind of electric grid, one that is built from the bottom up to handle the groundswell of digital and computerized equipment and technology dependent on it—and one that can automate and manage the increasing complexity and needs of electricity in the 21st Century. In short, the digital technology that allows for two-way communication between the utility and its customers, and the sensing along the transmission lines is what makes the grid smart. Like the Internet, the Smart Grid will consist of controls, computers, automation, and new technologies and equipment working together, but in this case, these technologies will work with the electrical grid to respond digitally to our quickly changing electricdemand. AKCP distributor, Raien Argentina worked together with INVAP to install a remote broadcast tower monitoring solution for digital TV broadcasting stations across Argentina. INVAP are a high tech engineering company based in Argentina with projects such as the construction of Nuclear Reactors in Chile, Australia, Algeria and Egypt. They have also been involved in government radar installations, space satellite programs and alternative energy generation. In this project INVAP were tasked with providing the systems integration services to build the shelters to be delivered to each broadcasting tower. The shelters were each assembled and wired in an aircraft hanger and then delivered to sites and craned into position, then connected to the wireless infrastructure towers. AKCP provided the remote monitoring solution that is installed at each of the broadcasting shelters. By deploying securityProbe5ES base units together with E-Sensor8 expansion modules, IO Digital8 controllers and E-Opto16 dry contacts together with a range of sensors the operation and safety of the equipment was ensured. Temperature and humidity sensors were utilized to monitor environmental conditions within the shelters. Sensor controlled relays managed the switching on and off of cooling equipment and other broadcasting equipment as and when needed. The total project covered more than 300 sites across the country during the first phase with future expansion of 1,000 broadcasting towers. INVAP selected the AKCP monitoring solution for its robustness and reliability, as well as AKCP's excellent after sales support service. Any problems or questions during installation were swiftly dealt with. During the implementation of the project AKCP also released an improved base unit, the securityProbe5ES, which replaced the securityProbe5E, and upgraded the already installed sites free of charge so all sites were on the latest hardware. AKCP as the world's oldest and largest manufacturer of SNMP based environmental monitoring solutions have a strong engineering team that were able to meet the challenges involved with monitoring of remote sites and wireless infrastructure monitoring. The modular design of AKCP's hardware and software allowed INVAP to deploy the systems in phases across regional areas with the same setup and configuration at each site. AKCP worked closely with their Argentinian distributor Raien who provided on site technical support and assistance to INVAP and liaised with AKCP engineers to solve any problems and also introduced some customizations to the product as requested by INVAP. A representative form AKCP also traveled to Argentina to meet with INVAP and ensure that everything was running smoothly. 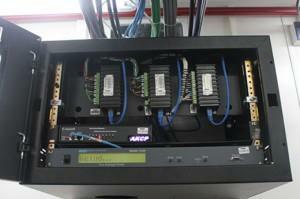 Asia's first ISO27000 certified data center monitors 400 sensors with AKCP. EASPNET has multiple IDC centers and provides hosting services to their customers. Not only a first class Data Center in Asia, eASPNet is proud to be the Tier 1+ Internet / Sub-marine Cable landing hub of Taiwan and housing world renowned carriers as the Asia POP such as AT&T, Sprint, BT, PCCW, and SingTel. eASPNet's IXC data center was the first data center in Asia to be certified as an international professional standard by TruSecure and receive ISO27000 certifications in year 2012. Using AKCP equipment they provide 99.999% reliability utilization and 24x7 monitoring services. They have multiple location across Taiwan and eASPNet trusts AKCP to monitor and run their mission critical components. Monitoring requirements include door and cabinet access in addition to temperature and humidity levels, water tanks, batteries, and oil tanks. Multiple locations are monitored at a singular Network Operations Center using AKCP's AKCess Pro Server. They have installed a securityProbe5ES-X60 on one floor with an additional expansion units on each additional floor. EASPNET then utilized the AKCess Pro Server in their control center to monitor sensors and dry contact status. Unit interfaces are then displayed on large screen monitors with in the NOC so all employees are aware of sensor statuses. The major reason that they decided to utilize AKCP solutions is because we can provide remote monitoring via IP and also support SNMP. It was imperative that all the units to communicate properly. On Friday 28th February 2014, in Scout Albano Quezon City Philippines, Vice President of Production Nicholas Barrowclough delivered an access control keynote demonstration at a Keysys dealer conference. Vice President of Production, Nicholas Barrowclough describes the benefits of AKCP remote site access control and environmental monitoring. More than fifty customers and resale partners attended the event to learn how AKCP are approaching the burgeoning data center and remote site markets through the delivery of innovative, next-generation environmental and server rack access control solutions. Headlining the event was the AKCP Dealer Demonstration Rack. Demonstration Racks from AKCP showcase a feature rich portfolio of environmental sensors and access control equipment including AKCP’s Cabinet Control Unit. Access Control Demonstration Racks combined with the AKCess Pro Server enable AKCP Distributors to deliver an exceptional, hands-on presentation to their customers. Nicholas began by demonstrating how AKCP’s Environmental and Access Control hardware works alongside AKCess Pro Server video monitoring software. “AKCess Pro Server lets customers review hundreds of hours of video in seconds using event driven playback. It integrates with AKCP Digital Cameras and hundreds of IP Cameras. You can integrate all of your CCTV systems in a single, easy to use piece of software. Nicholas demonstrated how to drag and drop graphs, doors, sensors, cameras and access control readers onto desktops and maps showing cities, countries, buildings, and specific rooms. Desktops and maps are easily combined to create an excellent visual representation of the entire network infrastructure. The AKCP sensorProbe and securityProbe series of devices being fully SNMP compliant can be integrated with a number of Network Management Software (NMS). Nagios is an industry standard open source NMS that is used to monitor IT infrastructure, thus reducing downtime and business losses. It manages the network by monitoring, alerting and reporting on network status, outages and infrastructure components. 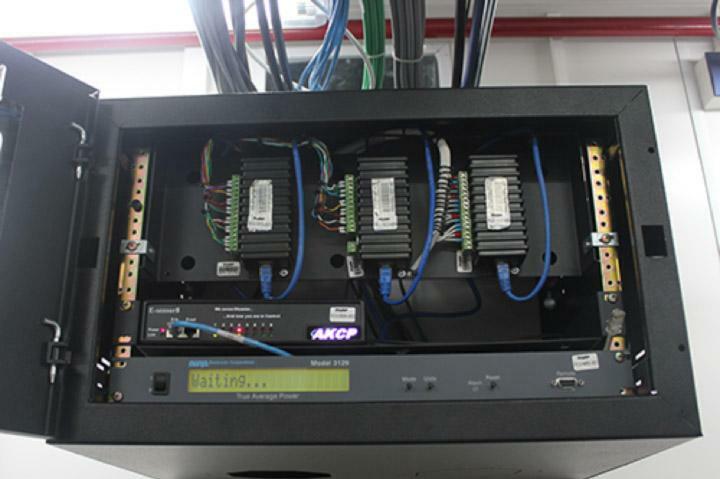 AKCP’s Environmental and Security monitoring solutions for data centers and computer rooms are rack-mounted devices that collect data from connected sensors, such as temperature, humidity and airflow. The base units can run as standalone units and report via E-Mail, SMS and other alerting methods, or be used as part of a greater network monitoring operation by communicating with the Nagios NMS through SNMP. AKCP devices were recently tested for compatibility by Nagios engineers and are now certified Nagios compliant. To find out more about how to connect your AKCP sensorProbe devices with Nagios click here. Keeping your data center up to date with current and future strategies requires innovative and adaptable solutions that can expand with your business demands. AKCP accomplishes this with designs that use a modular approach enabling customizable solutions that can be modified as you grow allowing you to meet the needs of the future. Whether you choose the securityProbe series, the sensorProbe series or the Door Control Unit, the AKCess Pro Server seamlessly integrates all of your base units and sensors forming a comprehensive solution that can be implemented at multiple locations simultaneously.